Mr. Earl Thomas Williams, 89, of Twinsburg, and formerly of Mentor, passed away Monday morning, December 17, 2018 at Anna Maria of Aurora. Mr. Williams was born on August 8, 1929 in Sanford, Maine, to the late Richard Howard Williams and the late Lydia Ann (Swett) Williams. 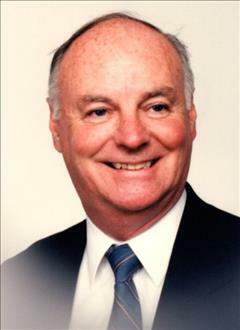 Earl graduated from the University of Maine in 1951 with a BA in Business Administration. He was a proud member of the Sigma Chi fraternity. After graduation he joined the General Electric Company as a Business Trainee in Pittsfield, MA. Over the next 38 years he remained with GE working at various locations including, Taunton, MA (Plastics), Lynn, MA (Rectifier), Lynchburg, VA (Rectifier), Utica, NY (Light Military), and Cleveland, OH (Lighting). The last 17 years of his career he most enjoyed recruiting, mentoring, and managing the new college graduates in the financial management training program. He retired in 1989. After retirement he became a winter resident of Punta Gorda, FL enjoying fellowship and activities at Burnt Store Colony where he lived. Earl is survived by his wife of 61 years, Phyllis E. (Sproul) Williams; son Thomas Earl Williams and his wife Marybeth and grandson Brian; daughters, Ellen Louise Williams and Sara Jane Wood and her husband Scott and grandchildren Sean and Allie. He is also survived by his two sisters-in-law Marian MacDonald and Virginia Williams; and many nieces and nephews. He was preceded in death by his brothers, Verne Augustin MacDonald and Roger Kitto Williams. A private service and burial will be held at a future date at Oakdale Cemetery in his home town of Sanford, ME.